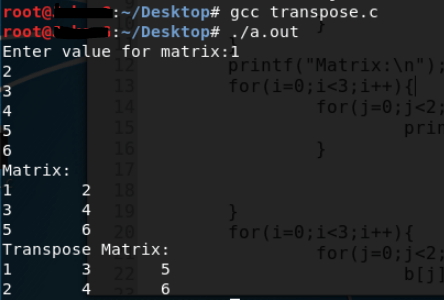 The following program print the transpose of the matrix in C. The transpose of a matrix makes the row to column and column to row. If the matrix is in the form a then the transpose of such a matrix will be a. About the Code: The code is written in two dimensional array taking  matrix size. You can increase the size if you want to. The code has been executed in Kali OS and working good with gcc and also will work with Dev C++.